Who is it for? 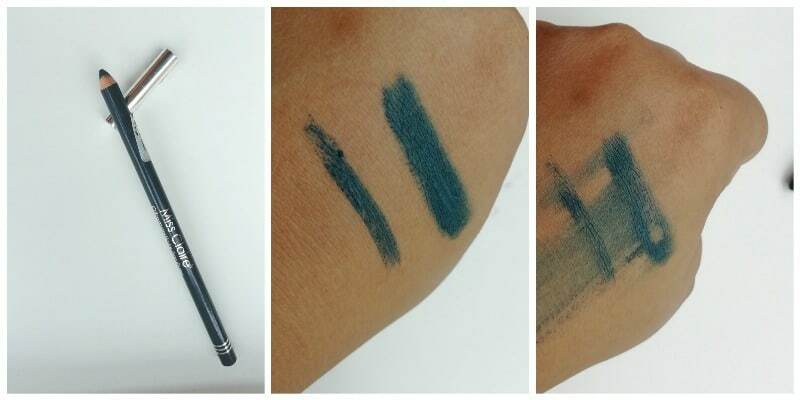 Miss Claire Glimmersticks for Eyes Tahitian Blue is for those beauties who love to add little drama to their eye makeup with a teal blue color. You can use this on your lower lash line, just like a normal kajal, or replace it with an eyeliner, or simply just fill in your eyelids. This comes in a sleek pencil packaging, with a silver pull off cap; I find this eye stick very travel-friendly and easy to work with. Just a little thing which bugs me was, it didn’t come with a sharpener. This has a super creamy, waxy texture and glides on easily. When you try to build up the shade. This clumps up. This has no fragrance at all… Bonus 🤩 you don’t want extra chemicals in your eyes. So this range has 21 shades… Most of which are shades of green or blue. They also have general shades of grey, black, white. I am totally loving the colors…They are so good for summers… Perfect for daytime or beachy looks. I got Tahitian blue E-07 for me, which is more of an algae green shade, with blue undertones to it; this shade will look good on both warm and cool skin tone…now coming to its performance. It delivers moderate pigments on the first stroke; you need to apply it multiple times for getting the maximum color payoff and even application. I already have oily eyelids, this smudges insanely. It won’t even last for more than an hour; I used it on the lower lash line and went beyond the rim of my eyes… This one doesn’t just stay… I also went on to use this on my upper eyelids. Again this just budged all over. Moreover, this leaves pigmentation after removing. You really need to be careful while working with it. You cannot draw a thin precise line with this one. As the nib of this pencil is quite thick. Leaves pigmentation on removing it. Clumps up when building up the shades. Not really, you can give this one a skip. If the stay part doesn’t bother you and you have dry eyelids you can give it a try. As this range has some gorgeous shades, moreover it’s dead cheap. But if you are heading out for longer periods. Skip this one. Miss Claire Glimmersticks For Eyes Denim – Good Buy?! Miss Claire Eye Shadow Shimmer Dust 18 – Get Your Bling On ! I have been wanting to try these for a while but I don’t think I will, after reading your review. I sweat a lot, and anything that is not smudge proof simply doesn’t work for me. This one is definitely not for you then… You can try out other eye pencils..